A wheelchair can confine you. You will feel liberated and freed from fittings. Using a wheelchair will provide you to move as normal as anyone who doesn’t use it. It will enable you to access many public places or to travel somewhere outside the town – even outside of the continent. You can see your wheelchair as a unique type of bicycle – as you can choose between various styles and designs, weights, and models for special purposes. Would you ever say that you can play tennis in a wheelchair? Well, you can! Designers made a special tennis wheelchair. You can choose until you find what is a perfect fit for you – a comfortable wheelchair which provides maximum functionality. It might seem confusing to pick the first wheelchair, but you have options. 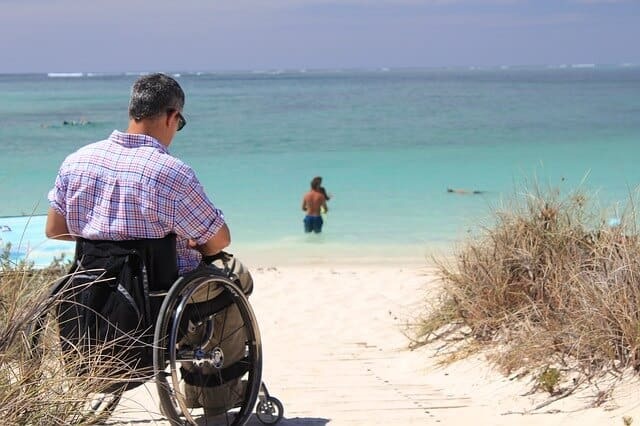 For example, work with an occupational therapist, or second – continue with reading our article and find out what is our best travel wheelchair . As we mentioned, there are many different types of travel wheelchairs. You can choose between two main categories – standard or lightweight wheelchair. Both of these have their advantages. Lightweight wheelchair, just like their name suggests, is much easier to handle or travel with. They might be less durable, as the accent with the lightweight wheelchairs is on increased mobility. If you or your loved one uses a wheelchair, then you want to get easy and comfortable transportation. A lightweight wheelchair is also an instrument for caregivers. Sometimes you need an assistance, so the lightweight portable wheelchairs makes everything easier for both of you. Once you find the best travel wheelchair for you, it will provide you many benefits. 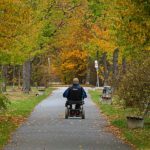 What should you look for in a wheelchair? A lightweight wheelchair frees you from remaining in one place if you travel. It gives you a possibility to travel more easily and freely. A heavy wheelchair, on the other side, might discourage you from ever leaving your home. Lightweight transport wheelchairs can bring a positive change to your lifestyle. You will be able to travel or to go to a Sunday shopping with your family, visit a friend, and many more activities. Persons who use wheelchairs most of the time, but can stand and walk the short distance, will put the wheelchair easily and sit in the driver’s seat. Lightweight folding chairs for traveling are a great choice if you want to get that feeling of traveling alone, without the need of a caregiver. Now that we mentioned the lightweight folding chairs for traveling, we will mention that you need a chair that is easy to fold up. When traveling, you need a wheelchair that will fit into your vehicle easily, or that you can store it in a tight space in your vehicle or your home. In order to transport a wheelchair, it has to be handy. 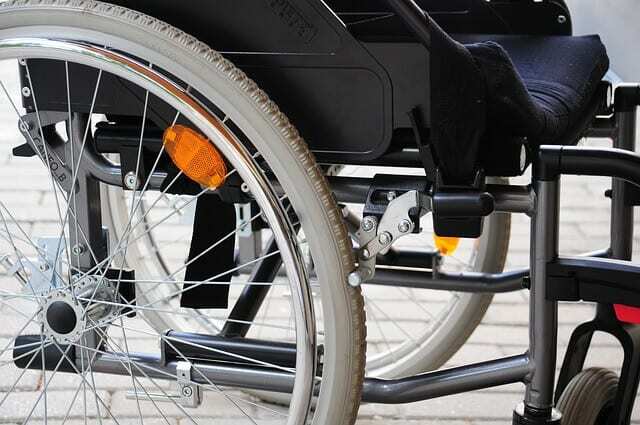 Lightweight wheelchairs fulfill these criteria completely. Lightweight chairs make it easy for the handicap person or caregivers to maneuver them easily. Heavy wheelchairs require more strength to push or move, which further reduces your mobility. We are aware that every one of you has an individual life situation. 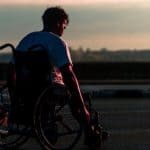 However, the right type of wheelchair might bring you new, great options and possibilities to handle your disability in the best possible way and live completely normal. If you have second thoughts about this choice, we are willing to help you to narrow the search. One of the most adjustable lightweight wheelchair that you will find on the market is a heavy-duty transport wheelchair by NOVA. You, as a user, will enjoy the unique armrest this wheelchair provides. It has a specially designed desk for your arms, which puts your arms in a comfortable position. You will have the possibility to roll yourself directly to any table. Most of the wheelchairs usually don’t provide this type of arms design. What is more, it has flip up deck arms, so that you can easily turn your wheelchair in a table or a desk. Of course that you want a wheelchair that is secure. Relax, as the NOVA heavy-duty chair is a wheelchair with hand brakes. It has Feather Touch hand brakes, so you will be safe even in the bumpy or rocky terrains. This heavy-duty chair has a capacity up to 400 pounds! Imagine this! Additionally, it has an extra wide seat, so you will feel the utmost comfort. Now, you would probably think that a wheelchair that has 400 pounds capacity must be extremely heavy. Surprise, surprise! The wheelchair aluminum frame doesn’t make it heavy. Oppositely, this heavy-duty chair is still lightweight. As you want a chair that will make you move and go different places, this NOVA heavy duty wheelchair is perfect for trips, as it folds easily and fits your trunk perfectly. You will put it in and take out the chair very lightly. This portable wheelchair will surely meet your expectations. It belongs to a category of the wheelchairs for narrow doorways. Designers put safety in the first place here, as this wheelchair has a seat belt. On the other side, its loop-lock handbrakes are easy to use, so you can sit in it comfortably and relaxed. You can adjust the footrest in order to make your time in a wheelchair more pleasant. The seat itself is pretty comfortable, too. Mediline made a wheelchair that is great for traveling by car, going down the bumpy street, or going across your lawn – basically, it adjusts to any surface. Durable aluminum (available in red or blue) frame ensures that you will use the chair for a longer period of time. The aluminum has the support of powder coating, keeping the rust and deterioration away. A wide seat of the wheelchair has nylon upholstery as support. Nylon is a remarkably breathable material, so you won’t get overheated. Drive Medical produced one of the best lightweight transport wheelchairs available on the market. This chair requires little maintenance. It has the wheels in the same size both in the front and the back. The chair isn’t too wide and it can get through any doorway. Narrow indoor layouts are no more problem with this wheelchair. Drive Medical produced a chair with a steel frame, that will give you the stability and durability of the chair. You wouldn’t have to think about new investment for a long time after purchasing this wheelchair. This is a type of a wheelchair with removable leg rest. The swing away leg rest is one of the best features of this wheelchair. You will be able to sit comfortably in it, while you can get up without any possibility to trip over the footrests. You will feel comfortable in this chair, as it has cushioned armrests. This prevents any potential arm pain for you. This super strong portable wheelchair will please your needs when we talk about storage and transport. You can easily check it on the airplane if you want to, as the Karman lightweight chair is great for any kind of travel. The producer is proud to announce that this is the lightest manual chair on the market. Its weight is only 19.8 lbs, while the frame weighs 14.5 lbs! What is more, it has a really competitive price. It has a removable footrest, so you won’t have to pay special attention while getting out of the chair. If you use the wheelchair for an extended period of time, this lightweight manual chair is the right pick. It has an S-shaped seating frame that prevents pressures and promotes better posture. Caretakers, Karman thought about you too. Companion brakes enable you to engage the break without bending down. No matter if you are ascending or descending a slope, the design of this wheelchair is extremely beneficial for both of you. If you are looking for the best travel wheelchair, well, this might be the one! It folds down perfectly and fits every type of storage or transport. For the times when you are not traveling, you can use it inside of your home, as it passes most of the doorways. This wheelchair weighs about 22 lbs, but don’t worry – it has a weight capacity up to 300 lbs! ProBasics made a wheelchair that is comfortable, as the padded full-length permanent armrests will be a great support for your arms. Large wheels provide better performance on every type of the terrain. You won’t feel anything more but a comfortable ride. Nylon seat straps will prevent overheating or sweating. You as a user are able to lock the brakes yourself, while your companion has an option of activating hand brakes also. Another safety feature of this wheelchair is a seat belt. There is no doubt that these top five lightweight transport wheelchairs on the market at the moment. Each one of them will provide you mobility, which is the goal. With a portable lightweight chair you will be able to go outside of your house, go to visit your cousins, or to go shopping, but what is the biggest advantage – you will be able to travel. It is up to you to choose a destination. Transport is problem no longer, as each one of the lightweight chairs in this article is foldable, so you can put it in the trunk or even transport it by plane. However, one wheelchair simply drew the most attention, as it is a mix of quality and affordability. We are talking about Karman Ergonomic Portabl Wheelchair. 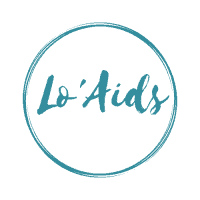 It has great customers’ reviews. On the other side, it is the most lightweight wheelchair on the market at the moment, and this is the effect that you want to achieve. It is light, but can bear great weights. Karman designed a wheelchair that provides mobility and comfort for the user, thinking about the caregivers at the same time. Caregivers are pleasantly surprised with the ease of wheeling the chair, which is an additional positive characteristic. We hope that we gave you an overview of the best travel wheelchairs for transportation that are available on the market. Even though there are many different brands out there, we presented you the top five wheelchairs by the opinions of the users and by our estimation. These are the wheelchairs for narrow doorways and the best lightweight folding wheelchairs for travelling at the same time. You see, you can use them for multiple purposes, which justifies the investment. You are able to provide yourself an even better experience by using the wheelchair accessories. They can actually make your life even easier if you or someone you care about uses a wheelchair. Each one of the travel wheelchairs in this article provides exceptional quality at a reasonable price. They are also comfortable, easy to store, and what is the most important – easy to use. Travel wheelchairs will give you the option to travel wherever you want. You don’t have to worry about the size, or design, or about the comfort, as every wheelchair that we presented in this article fulfills the most important criteria when it comes to transport and comfort. Further, the top five wheelchairs are easy to pass through most of the doors. Everything is so accessible to you now. It is up to you to pick the one that sparked the interest within you the most and prepare for the better tomorrow. If needed, you might also get a wheelchair ramp that fits your wheelchair, which will open the world to you completely. Possibilities in front of you are endless! Restore your mobility or a mobility of your beloved person today. Sit down in your comfortable chair and go towards new, fabulous experiences that will happen in your life.